Why? Because we never pass up the opportunity to sling Sean Connery puns. Also, this lunar ash hole is actually pretty cool. These images, above and below (of the ash hole, not Mr. Connery), were photographed by NASA's Lunar Reconnaissance Orbiter. More info here. 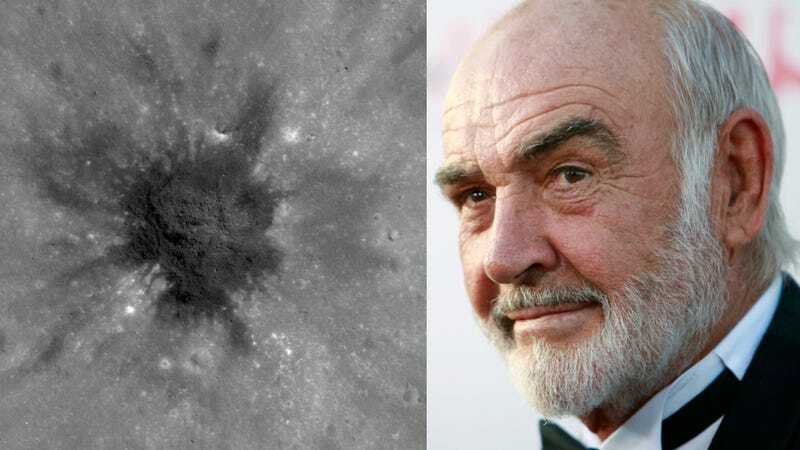 As Bad Astronomy's Phil Plait explains, craters on the Moon used to be a frequent topic of debate among astronomers. Were these bowl-shaped cavities the remnants of volcanos, or evidence of impact events? This odd-looking feature took me a few minutes to figure out, even after reading the description page. What you're seeing is an impact crater about 170 meters (185 yards) across – the whole image is 450 meters (500 yards) in width. But what's all that black stuff in the middle? The picture inset here is an overview of the region (about 200 km across), and you can see the big blanket of darker material on the somewhat lighter lunar surface. The asterisk marks the location of the above picture. The dark stuff is pyroclastic – ash and other material that's been blown out of volcanic vents in what are called fire fountains. In this inset picture it looks dark, but when it was fresh it was even darker. Over the eons, blasting by subatomic particles in the solar wind – think of it as cosmic erosion – has lightened it. Either that, or nearby impacts blew lighter-colored material over it. Read more about this interesting lunar feature over on Bad Astronomy and the Lunar Reconnaissance Orbiter Blog.